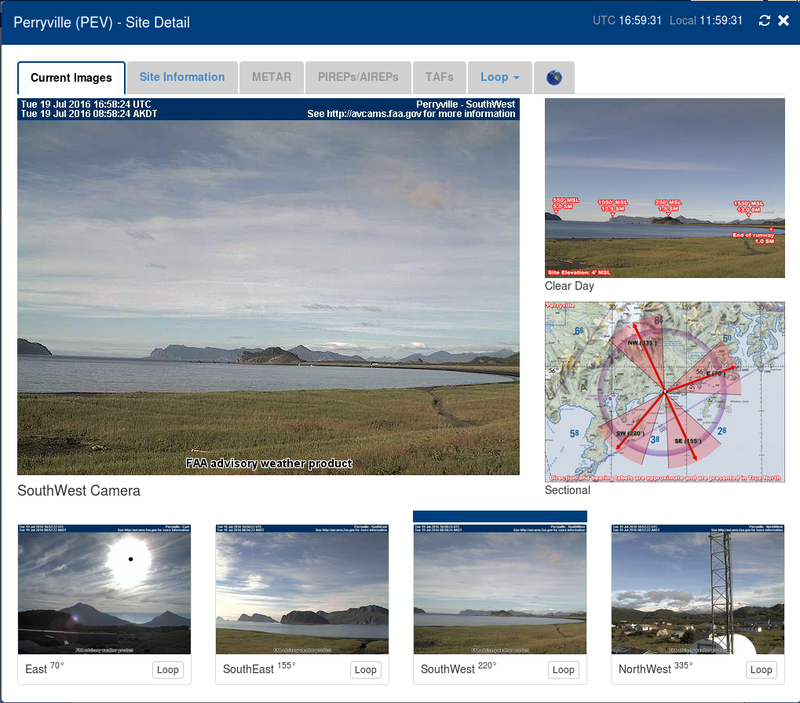 The FAA website that includes webcams over much of Alaska provides a great opportunity to match IFR Probability fields with surface observations. 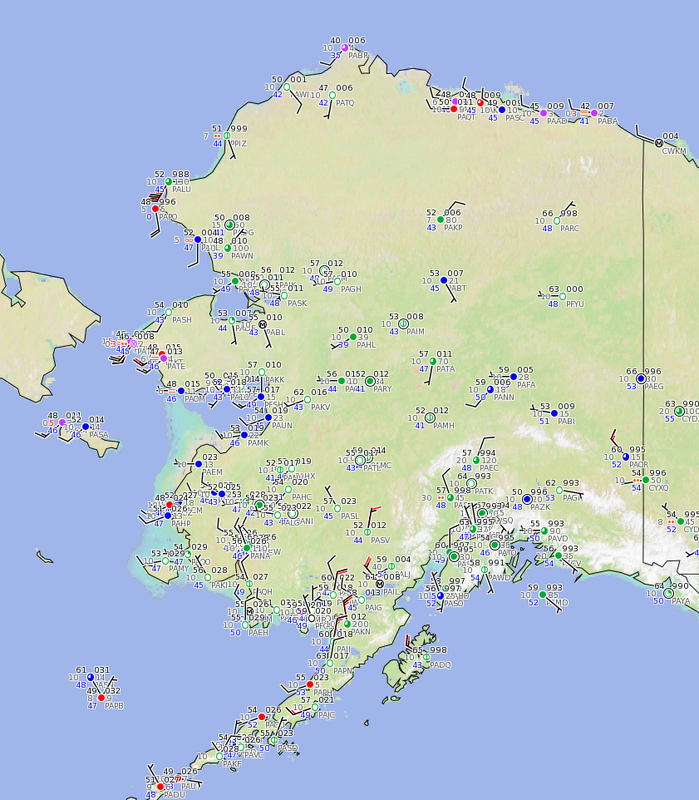 In the image above, Wainwright AK shows a 3-mile visibility, but Barrow and Deadhorse farther east report 10-mile visibilities. All three stations are very near high IFR Probabilities — the red/orange region has IFR Probabilities exceeding 90%. 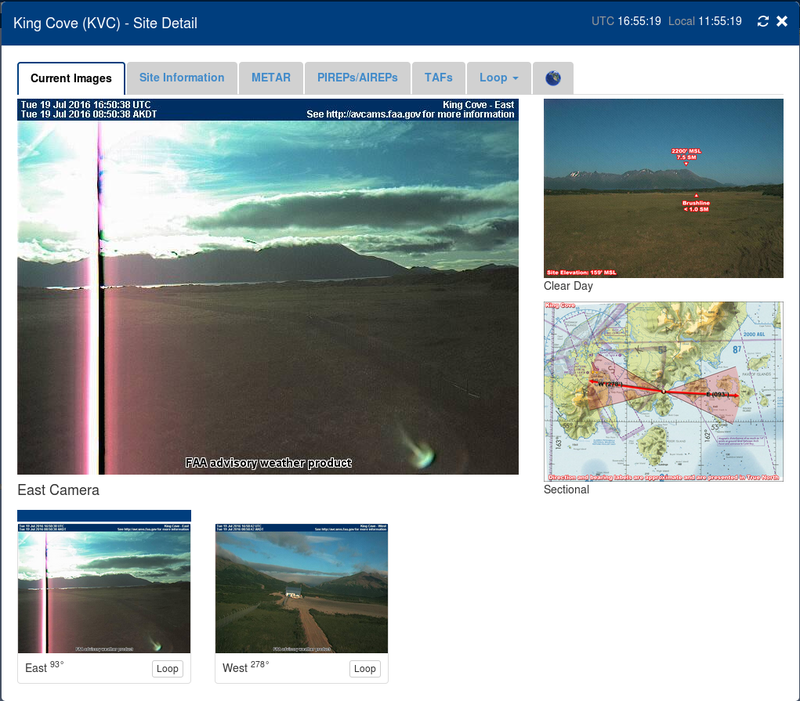 What to the webcams at the three stations show? Screen captures from the three webcams are below. 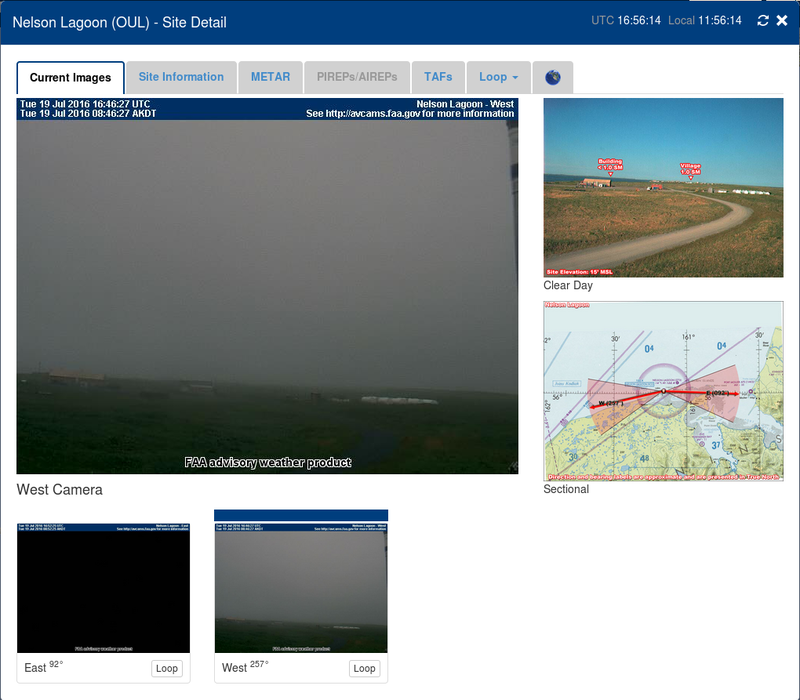 Webcams from both Barrow and Deadhorse show non-IFR conditions. Wainwright shows a dense fog through which the sun is dimly visible. 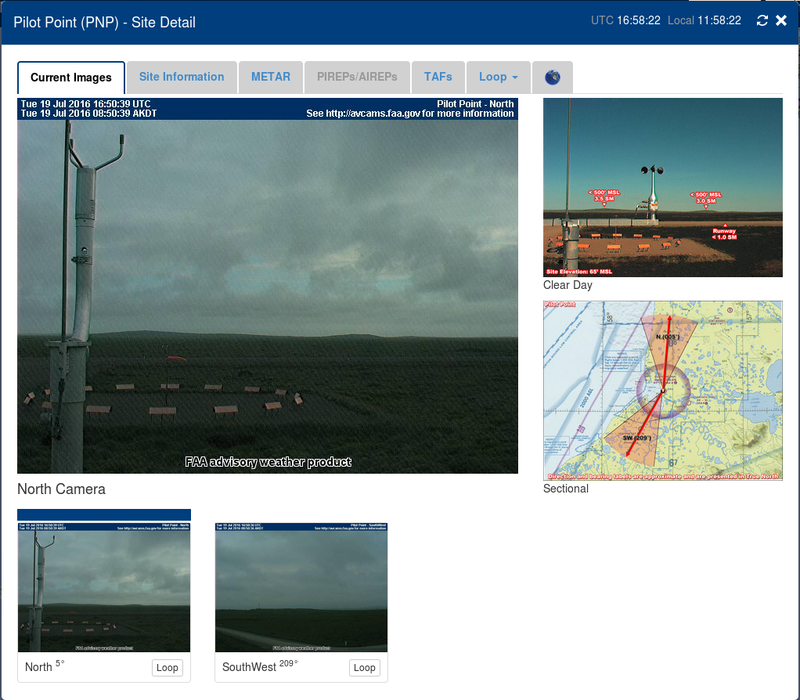 These webcam observations are in general agreement with the GOES-based IFR Probability fields: only Wainwright is in a region where IFR Probabilities are consistently high. 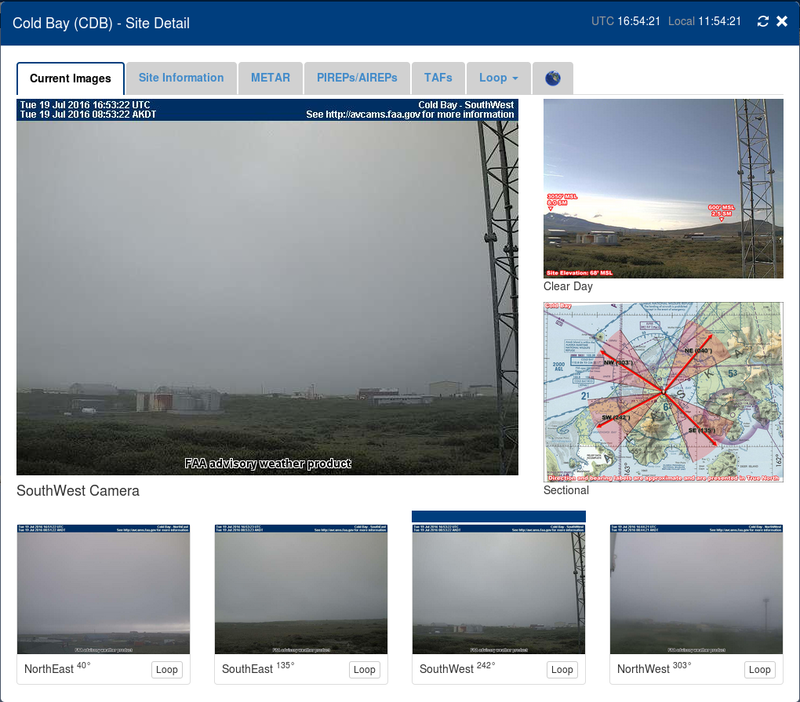 The image above is of GOES-R IFR Probabilities over the Aleutians, along with surface observations of ceilings and visibilities. In general, IFR Probabilities are a bit higher on the northern side of the Aleutians (False Pass, Cold Bay, Nelson Lagoon, Port Heiden, Pilot Point) than the southern side (Perryville, King Cove). That is confirmed with the screen captures of webcam imagery, seen below. The webcam scenes are aligned from west to east, starting at False Pass AK and ending at Pilot Point. This entry was posted in Alaska on July 19, 2016 by Scott Lindstrom. The low Sun Angle at very high latitudes during Summer presents a challenge to the GOES-R IFR Probability algorithm. Solar backscatter from clouds in the visible and near-infrared (3.9 µm) channels make traditional fog detection methods (Brightness Temperature Difference between 10.7 µm and 3.9 µm) problematic, but they also are a challenge for GOES-R IFR Probability. At mid-latitudes, when 3.9 µm radiation is changing quickly because of rapid changes associated with a rising (or setting) sun, the ‘satellite’ portion of GOES-R IFR Probability will be frozen for a time step or two. In the GOES-R Algorithm, temporal data (in other words, data from previous times) are used starting at the beginning of the terminator transition periods (that is, when the sun is rising or setting) and it’s used until valid data, either day or night predictors, depending on whether it’s sunrise or sunset, is again available. At mid-latitudes (as seen in the example at the bottom of this post), the transition period is typically less than thirty minutes in length. At high latitudes, however, when the sun lingers near the horizon for hours, the use of temporal data can stretch out for several hours and products will not be updated during that time. This effect happens only in the months surrounding the Summer solstice. Consider the animation above, of GOES-R IFR Probability north of Alaska, over the Arctic Ocean. IFR Probabilty varies with each time step over much of the image, especially, for example, near the lower left corner (a region that includes the Brooks Range). There is a significant region, though, where values do not change over the three hours of the animation — this is because of the low sun angle and the difficulty in relating the 3.9 µm emissivity to a fog property. (You can detect at the end of the animation changes starting to impinge on the region of a static signal from the west) The three hour animation from 1100-1400 UTC, below, shows changes in the field over much of the domain over the Arctic Ocean. 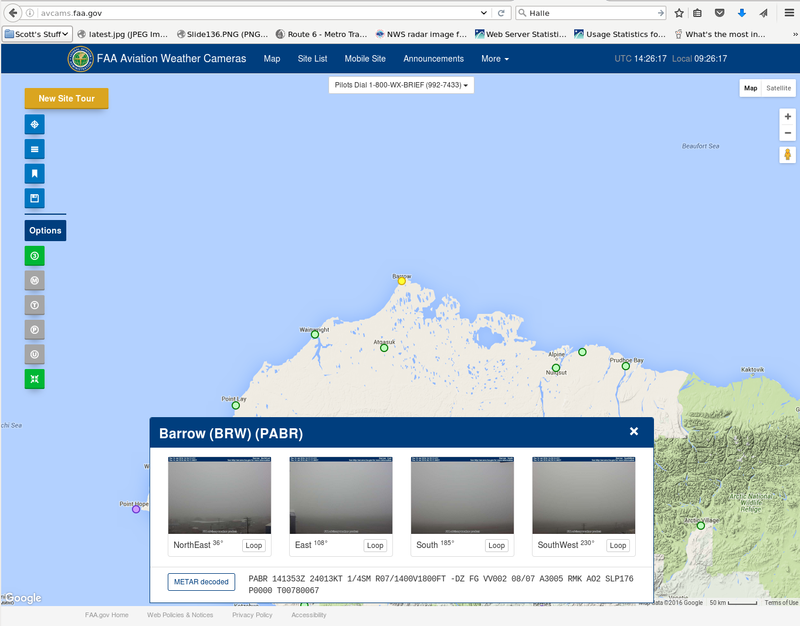 Barrow Alaska (PABR) develops IFR conditions during this animation as low clouds move south from the ocean. GOES-R IFR Probability fields suggest that the fog does not penetrate far inland. Much of northern Alaska had record high temperatures on 13 July (It was 85 in Deadhorse, for example) with light south/southwest winds that would keep the ocean stratus offshore. 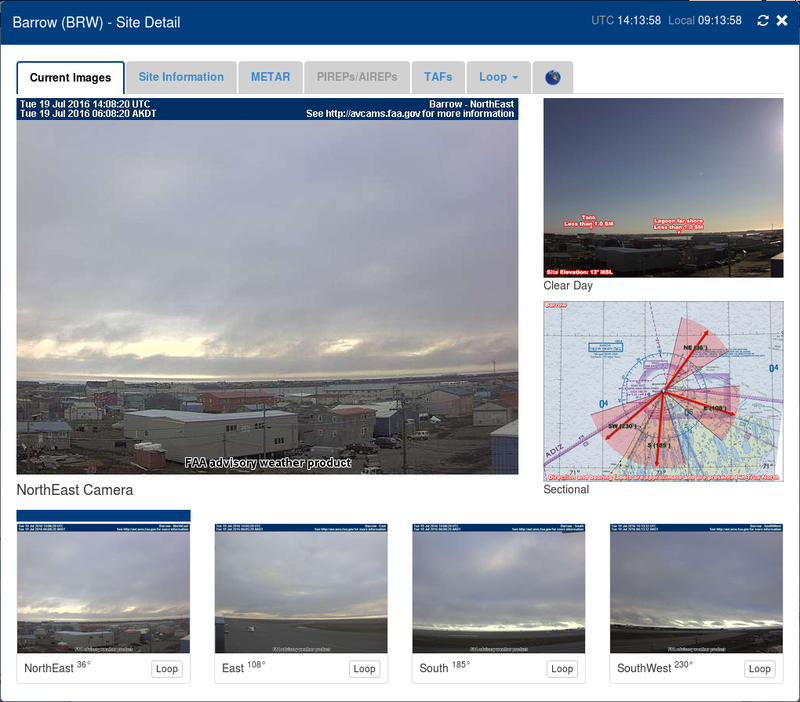 Webcam views at Barrow (from this link) confirm the presence of IFR conditions. When GOES-R is flying, data the 8.4 µm channel will be incorporated into the GOES-R IFR Probability algorithm. This channel (Band 11 on the GOES-R ABI) is not so adversely affected by reflected solar radiation as the 3.9 µm channel so the unchanging nature of GOES-R IFR probability fields will be mitigated. This stationarity in the GOES-R IFR Probability is apparent at mid-latitudes as well. Careful inspection of the animation below, from 1300-1400 UTC on 14 July 2016, shows a region of static IFR Probability fields off the coast of northern Oregon between 1315 and 1345 UTC. This entry was posted in Alaska on July 14, 2016 by Scott Lindstrom. GOES-R IFR Probabilities computed using GOES-15 pixels over Alaska suffer from problems inherent in any Geostationary Data Product at high latitudes: Pixel sizes are large. In addition, ‘limb brightening’ — that is, the shift in a brightness temperature towards cooler values because the path length of photon towards the satellite travels through more of the upper (colder) troposphere (a cooling that is also dependent on wavelength being sensed) — affects the brightness temperature difference product that is used to detect water-based clouds. MODIS data from Terra and Aqua has a much higher spatial resolution and a superior view angle. It’s fairly simple to use both MODIS data to get an idea of conditions in and around Alaska, and then use GOES data to approximate the temporal change. Terra and Aqua view Alaska frequently (link) — it’s uncommon to go more than 6 hours without a view. The toggles below show a series of MODIS IFR Probabilities and corresponding GOES-15 IFR Probabilities from late on 8 July 2016 through mid-day on 9 July 2016. From 2100 UTC to 1400 UTC — 17 hours — there are 7 separate MODIS views of Alaska, and they show similar features. For example, the high terrain of the Brooks Range is apparent: larger values of IFR Probabilities are noted there. The same is true over south central Alaska, over the Alaska Range in between Anchorage and Fairbanks. Interpretation of IFR Probability fields over the State require this background knowledge of Topography. 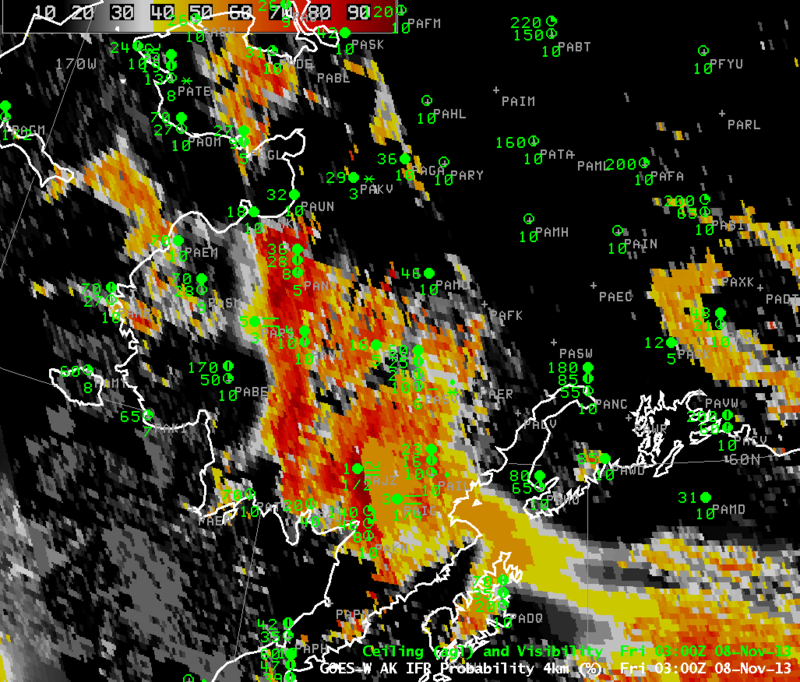 The scenes above suggest that most IFR Conditions near Alaska are offshore during the early morning of 9 July. On 11 July 2016, some of those regions of reduced visibility crept onshore, as shown in the plot below from this site, where surface stations are color-coded by Flight Rules: Red and Magenta denote IFR and Low IFR conditions. 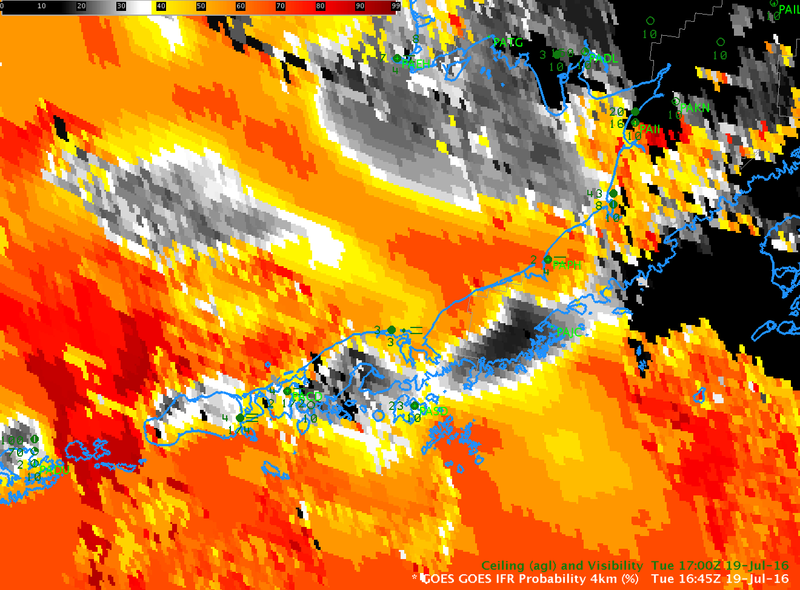 GOES-15-based IFR Probability fields from near that time show high probabilities along the coastline of Alaska. 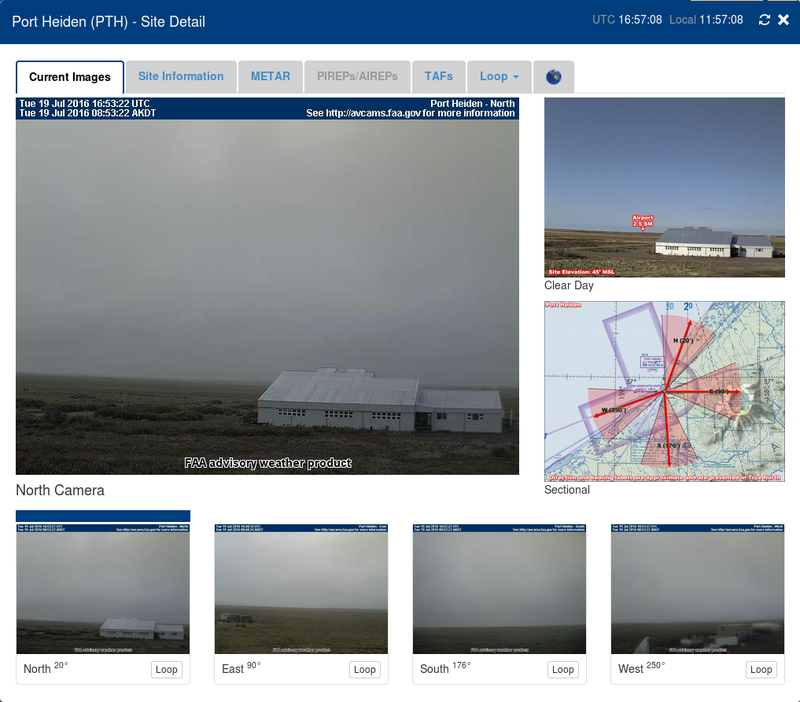 Note that the presence of IFR Conditions can also be deduced from this set of webcams! 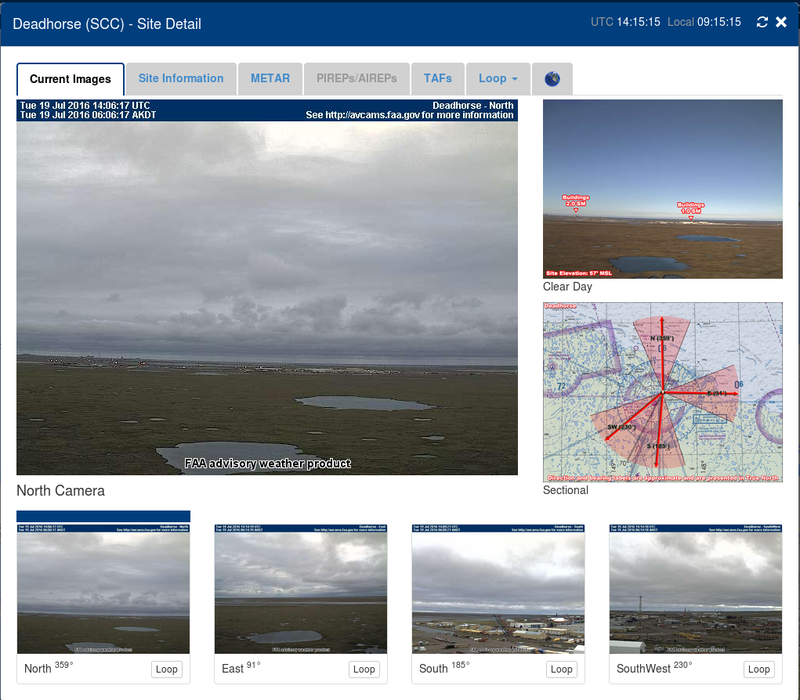 Consider, for example, this webcam site just west of Prudhoe Bay, in a region where GOES-based IFR Probabilities are high. This entry was posted in Alaska, MODIS on July 11, 2016 by Scott Lindstrom. A challenge in using GOES-R IFR Probabilities at high latitudes is that GOES pixels are larger, typically twice or three times the size of pixels over the lower 48. If Fog is starting out as a small-scale phenomenon, the early development of the feature can be missed. Dense fog developed over southeast Alaska on the morning of 8 September. The animation of GOES-15-based IFR Probabilities, below, shows the slow increase in areal extent to the IFR Probabilities in the six hours between 0445 and 1045 UTC; values also increased. 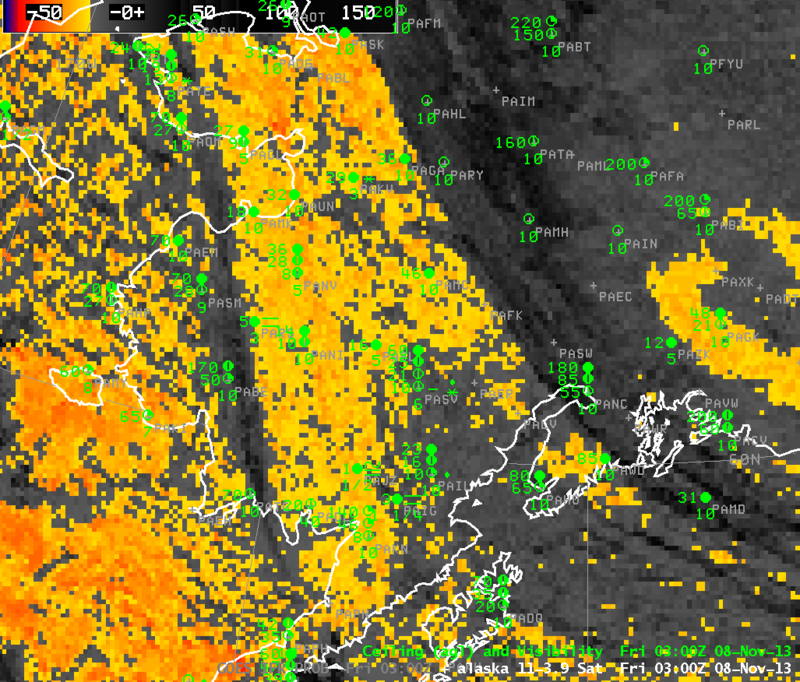 This slow increase in concert with observations can increase confidence that wide-spread dense fog is possible. MODIS data from Terra and Aqua can also be used to compute IFR Probabilities, and the high resolution information from these two polar orbiting satellites can clarify where fog might be occurring. Additionally, MODIS fields are a bit more frequent over Alaska than they are over the lower 48. The 0600 and 0737 UTC passes, shown below, show how MODIS data can be used to refine the GOES-based information at times during the night. The temporal change between MODIS information at 0600 and 0737 UTC also confirms the trend observed in GOES data alone. This entry was posted in Alaska, MODIS on September 8, 2015 by Scott Lindstrom. At very high latitudes, limb effects can alter the brightness temperature difference between 10.7 µm and 3.9 µm. GOES also has very large pixel sizes at high latitudes. The image above toggles between the GOES-R IFR Probability computed using MODIS and GOES-15. Observations — scant over Alaska — of ceilings and observations are superimposed on the imagery. 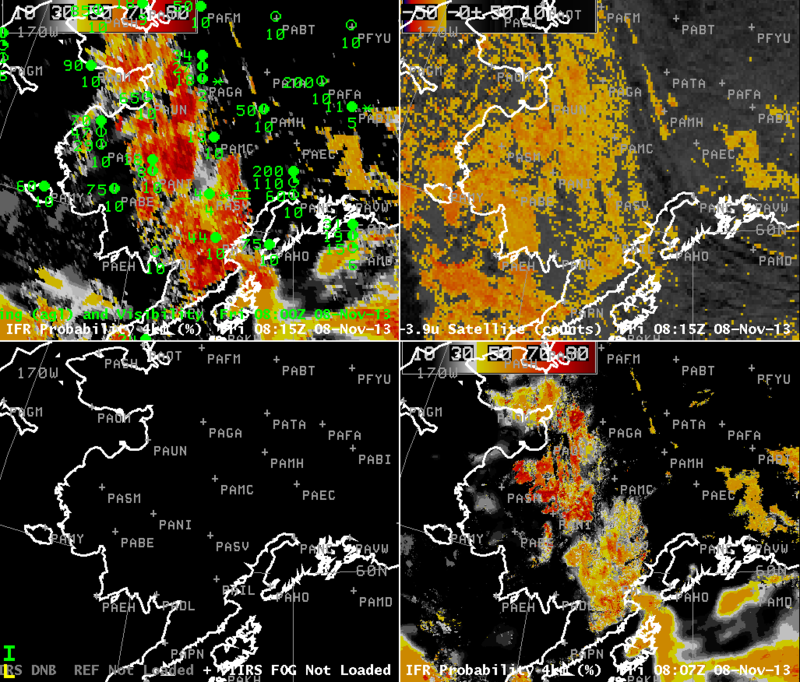 GOES-based GOES-R IFR Probabilities are elevated over much of Alaska; in contrast, MODIS-based IFR Probabilities show larger values in only a few regions. MODIS-based values at high latitudes are available frequently compared to lower latitudes. At 0830/0845 UTC, below, MODIS data show a slow expansion in values (note that eastern Alaska was not viewed by MODIS at this time). At about 1100 UTC, the slow areal increase in IFR Probabilities continues. The 1100 UTC MODIS pass was over only eastern Alaska, and it shows relatively large values in some spots of northeastern Alaska. The high values from the GOES-based GOES-R IFR Probabilities over central Alaska can probably be discounted. Note, however, that the highest GOES-based GOES-R IFR Probabilities do have a counterpart in the MODIS-based field. At 1400 UTC, no MODIS pass was available. The GOES-based image, below, again has large values over northern Alaska (with corroborating surface observations at Point Lay (where snow is falling) and at Atqasuk (where freezing fog is reported). MODIS-based data from earlier in the day adds confidence to the discounting of widespread modest (40-50%) IFR Probability values over central Alaska. This entry was posted in Alaska, MODIS on April 14, 2015 by Scott Lindstrom. 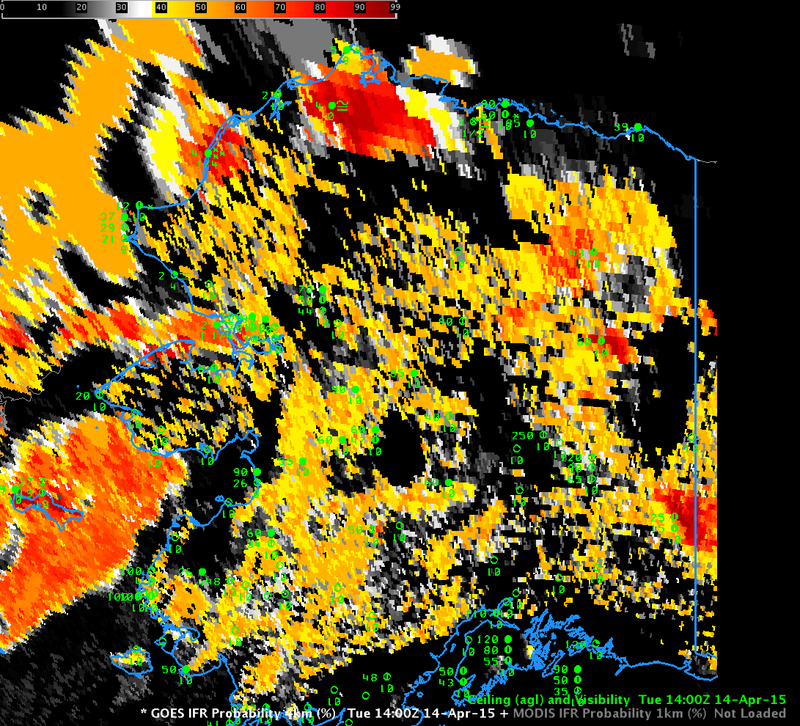 GOES pixels grow to large sizes at high latitudes, such as those found over northern Alaska. Consequently, the IFR Probabilities can give information that is difficult to interpret. Data from the polar-orbiting MODIS instrument (on board Aqua and Terra satellites), in contrast, have nominal 1-km resolutions even at high latitudes. In the toggle of imagery above, the MODIS IFR Probabilities suggests low clouds just north of the Brooks Range in northern Alaska. In contrast, the IFR Probabilities based on GOES-15 are difficult to interpret. Consider using the MODIS-based IFR Probabilities. At very high latitudes, data from polar orbiters is more frequent than at mid-latitudes. Thus, there is a benefit from higher spatial resolution without an onerous loss of temporal resolution as happens in mid-latitudes. This entry was posted in Alaska, MODIS on January 14, 2014 by Scott Lindstrom. 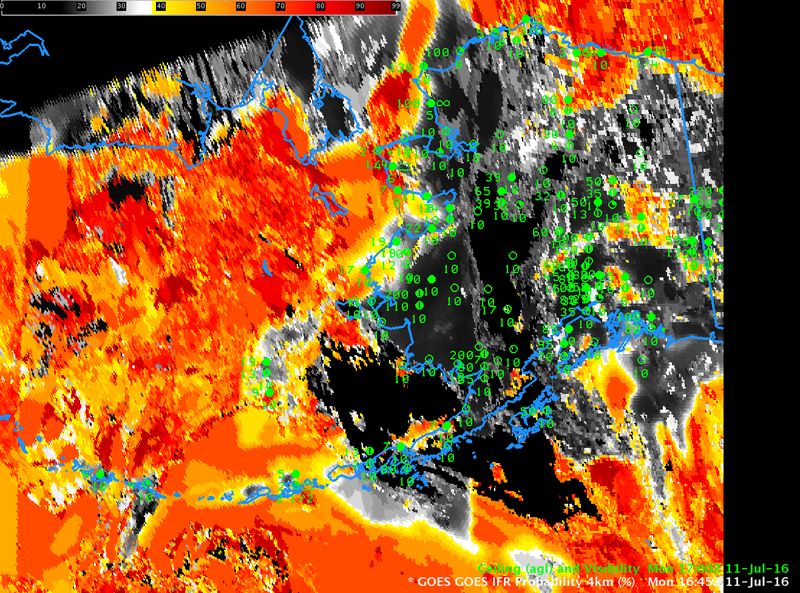 The image toggle above shows IFR Probability and the Brightness Temperature Difference Field over northern Alaska. Plotted METAR observations show very cold surface temperatures in the -30 to -50 F range. 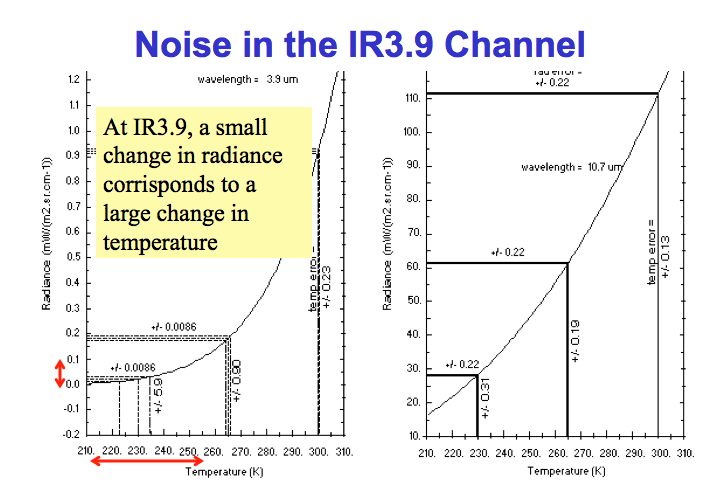 At such cold temperatures, the pseudo-emissivity computation can become noisy because a very small change in 10.7 µm radiance (used to compute the 3.9 µm radiance) can cause a large change in 3.9 µm brightness temperature. (The effect is shown graphically below — a small change in radiance at 3.9 µm leads to a very large temperature change). This noise can lead to a speckled appearance to the IFR probability fields. This effect can also occur in the northern Plains of the United States when surface temperatures dip below zero. (update) Below is the IFR Probability in the heart of a Polar Airmass over northwestern Ontario. This entry was posted in Alaska, Error Explanations, Northern Plains on December 26, 2013 by Scott Lindstrom. 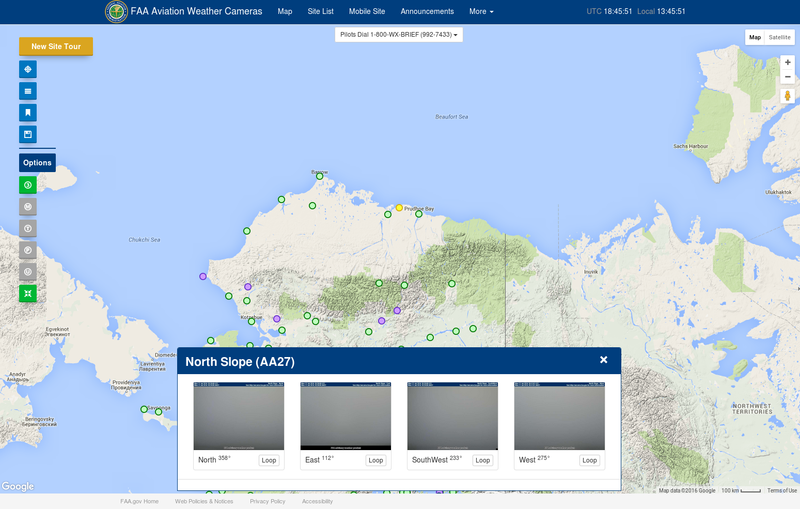 Fog and low stratus were present over southwestern Alaska early on November 8. How did the GOES-R IFR Probability fields perform compared to the heritage brightness temperature difference (in this case, 10.7 µm – 3.9 µm from GOES-15). Consider the airport PARS (southwest of Anvik — PANV and northwest of Aniak — PANI). 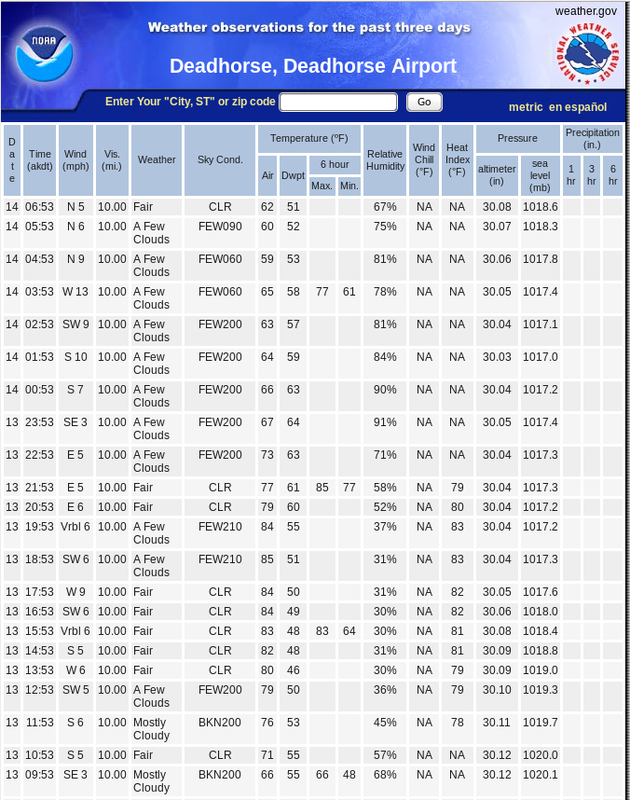 IFR conditions are present there until 0900 UTC, when ceilings rise and IFR probabilities drop. Subsequently, IFR Probabilities increase again as a north-south oriented region of higher IFR probabilities moves over, and IFR conditions are again present by 1600 UTC. Further south, PAJZ and PAIG report IFR conditions when IFR Probabilities are high, and conditions improve as IFR Probabilities decrease. IFR Probabilities initially around PAIG have the characteristic flat field (and somewhat lower probability) associated with a region where high-level clouds are present. In these regions, only Rapid Refresh data can be used to compute the probability; because satellite predictors are not used, the computed IFR probabilities are lower. Compare the IFR Probability field, above, to the Brightness Temperature Difference field, below, that has been color-enhanced to highlight regions where water-based clouds may be present. The IFR Probability field correctly reduces the regions where IFR conditions might be occurring. That is, the traditional brightness temperature difference field is plagued by many false positives. 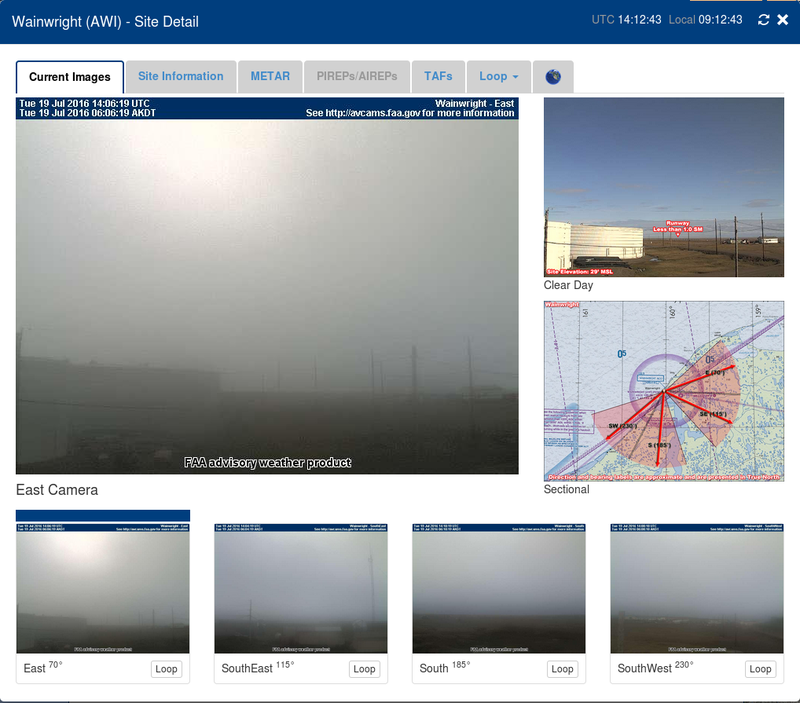 This is because mid-level stratus that is unimportant for transportation looks to a satellite to be very similar to low-level stratus that is important for transportation. MODIS data from the polar-orbiting satellites Terra and Aqua can also be used to compute IFR Probabilities, and MODIS data — although less frequent than the data from the geostationary GOES-15 — has far superior horizontal resolution (nominal MODIS resolution is 1 km at nadir) to GOES data (nominally 4 km at the sub-satellite point over the Equator) over Alaska. Small-scale features are much more likely to be detected in MODIS data, as shown below. The Day/Night band from Suomi/NPP can sometimes be used to detect cloud features. However, when the Moon is not present to provide illumination, cloud detection is a challenge. In the toggle above between the Day/Night band and the brightness temperature difference from VIIRS (11.45 – 3.74), for example, there is little evidence of the apparent cloud edge that is visible both in VIIRS data, in GOES-15 data (Upper right) and in the IFR Probability fields from GOES (Upper Left) and MODIS (Lower Right). This entry was posted in Alaska, Day/Night Band, MODIS, Suomi/NPP on November 8, 2013 by Scott Lindstrom.